Global specialty food ingredients market expected to reach approximately USD 121.6 billion by 2024, growing at a CAGR of around 6.2% between 2018 and 2024. Specialty food ingredients are the ingredients typically used for texture, color, emulsify, and preserve food products. The report covers a detailed analysis and forecast for the specialty food ingredients market on a global and regional level from 2015 to 2024. The study offers historical data from 2015 to 2017 along with a forecast from 2018 to 2024 based on revenue (USD Million). The study comprises a comprehensive view of the market with the review of market drivers, restraints and opportunities. It also provides the level of impact of drivers and restraints on the specialty food ingredients market between 2017 and 2024. The study included a detailed competitive scenario and product portfolio of key vendors. The report evaluates Porter’s Five Forces model to analyze the different factors affecting the growth of the specialty food ingredients market. Moreover, the study encompasses a market attractiveness analysis, which provides the most attractive and least attractive market segments information by type, application, and region. The report includes detailed segmentation of the specialty food ingredients market based on type, application, and region. On the basis of type, the market can be fragmented into enzymes, emulsifiers, flavors, colorants, vitamins, minerals, antioxidants, and preservatives. Based on application, the market can be segmented into bakery & confectionery, beverages, dairy & frozen foods, convenience foods, meat products, functional foods, and dietary supplements. Major regional segment analyzed in this report include North America, Europe, Asia Pacific, Latin America, and the Middle East & Africa with its further divided into major countries including the U.S., Germany, France, the UK, China, Japan, India, and Brazil. 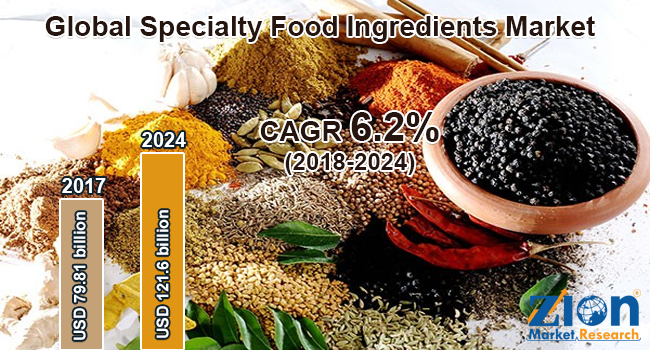 The report offers a comprehensive competitive outlook including company profiles and market shares of the key players functioning in the global specialty food ingredients market. The key players included in the report are Archer Daniels Midland Company, Naturex, Tate & Lyle Plc, Prinova Group, LLC, Frutarom, Roquette Frères S.A, Ingredion Incorporated, Cargill Inc., Specialty Commodities Inc., AmTech Ingredients LLC, E. I. Dupont De Nemours and Company, Sensient Technologies Corporation, Koninklijke DSM N.V., Ingredion, KF Specialty Ingredients, Woodland Foods Inc., Kerry Group Plc, PPG Industries, Vidhi Specialty Food Ingredients Limited, and Evonik.